This is where we get into the stats, big time - and not just the standard issue 5x5 Head to Head or Rotisserie stats, either. No, no... this is where we take the fantasy baseball stats and pump them full of steroids, HGH and - what was that we heard recently - deer antler spray?! 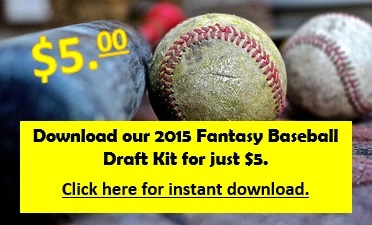 Anyway, in order to properly analyze a player's fantasy worth, our Fantasy Baseball Cheat Sheets for the 2015 season use multiple Statistical Indicators that help us - and you - determine a player's true fantasy worth and rankings so you can dominate the n00bs in your league who don't know their a-hole from a donut weight.